This image is derived from a mosaic of Landsat Multispectral scanner (MSS) images of the Central Arctic Management Area (CAMA) and the Arctic National Wildlife Refuge (ANWR), Northeast Alaska. The mosaic was prepared by the National Mapping Division, U.S. Geological Survey EROS data center, Anchorage, Alaska. Processing was done using bands 2, 3, and 5 of Landsat MSS scenes acquired during the period 4 August 1976 to 2 August 1985. This preliminary classification was derived from the CAMA mosaic data. An Isodata unsupervised classification approach was used to derive 40 spectral classes, which were grouped into 7 landcover classes. Previous Landsat-derived maps and geobotanical maps of the region were used for ground information to interpret the spectral classes. (Walker 1985 unpub; Walker and Acevedo 1987; Walker et al. 1995 unpub.). The classfication was done using ENVI image analysis software produced by Research Systems, Inc.
Vegetation units are groupings of finer-level units mapped at numerous sites within the basin (Walker et al. 1995; Walker et al. 1994). Soil units were derived from field reconnaissance, detailed examination of soils at flux 12 tower sights, and a review of the literature relating soil taxa to vegetation types along the North Slope. The legend includes soil subgroups from the current SOIL TAXONOMY (Soil Survey Staff, 1965; 1994) and soil great groups from the recently proposed soil order dealing with permafrost-affected soils, the Gelisols (Bockheim et al., 1994). Bockheim, J.G., Ping, C.L., Moore, J.P., and J.M. Kimble. 1994. Gelisols: a new proposed order for permafrost-affected soils. In J.M. Kimble and R.J. Ahrens (eds). Proceedings of the meeting on the classification, correlation, and management of permafrost-affected soils. July, 1994: 25-44. U.S. Dept. of Agriculture. Soil Conservation Service. Soil Survey Staff. 1975. Soil Taxonomy: A Basic System of Soil Classification for Making and Interpreting Soil Surveys. U.S. Dept. of Agric. Handb. 436. U.S. Govt. Print. Off. Washington, DC. 754 pp., illus. U.S. Dept. of Agriculture. Soil Conservation Service. Soil Survey Staff. 1994. Keys to Soil Taxonomy, 6th ed. Natural Soil Survey Laboratory, Soil Conservation Serivce, Lincoln, NE. Walker, D.A. 1988. Terrain and vegetation types of the Sagavanirktok Quadrangle, Alaska. NASA-Ames University Consortium Final Report, 56 pp. Walker, D.A., Acevedo, W. 1987. Vegetation and a Landsat-derived land cover map of the Beechey Point Quadrangle, Arctic Coastal Plain, Alaska. CRREL Report 87-5. , 63 (plus Map L-0211). Walker, D.A., M. Walker, N. Auerbach, L. Lestak, B. Lewis, Rose, K. 1995. 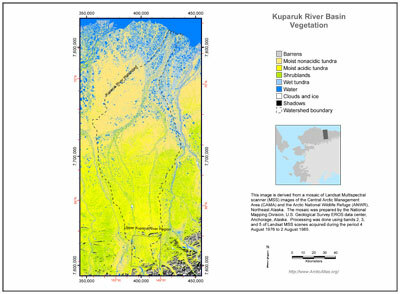 A vegetation map of the upper Kuparuk River region, Alaska: a component of a hierarchic GIS for studies of arctic land-atmosphere interactions. Presented at Tenth Annual ESRI European User Conference. Palm Springs, CA May 22 - 26. The University of Alaska Fairbanks is an affirmative action/equal opportunity employer and educational institution.